Today’s Nar Shaddaa Style article is inspired by Princess Leia and Carrie Fisher, to celebrate Carrie’s birthday. 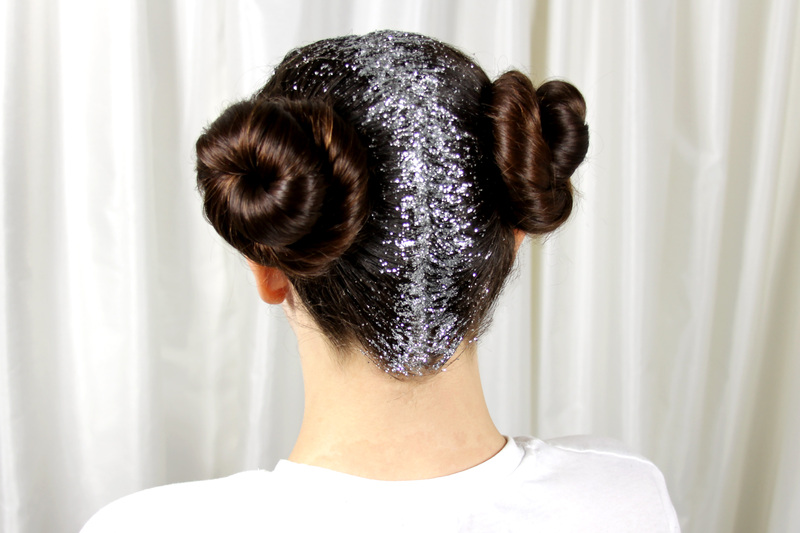 Princess Leia is known for her amazing hairstyles, so I wanted to create a Princess Leia inspired hairstyle that also paid homage to Carrie herself. 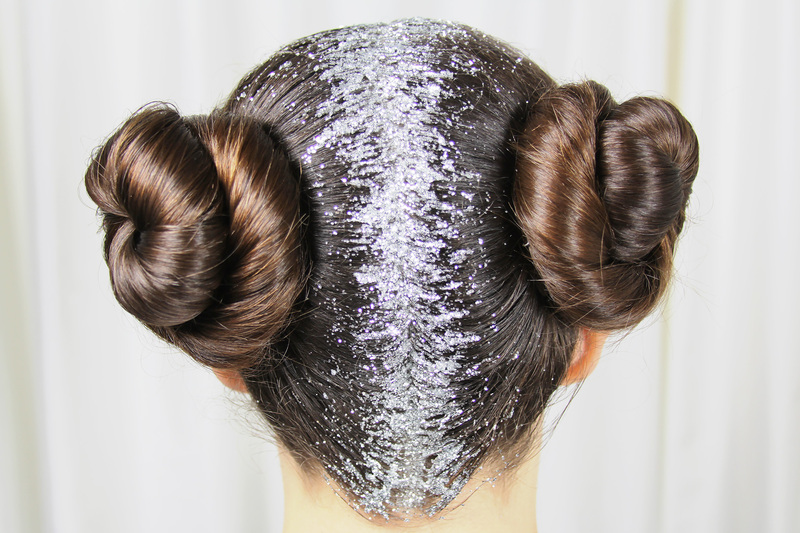 For these hairstyles, I used craft glitter – please note this is not safe to use on the face, use only ‘eye safe’ makeup glitter like Lit Cosmetics. Put your hair up in two buns – make them any shape you want, this is an inspired look. 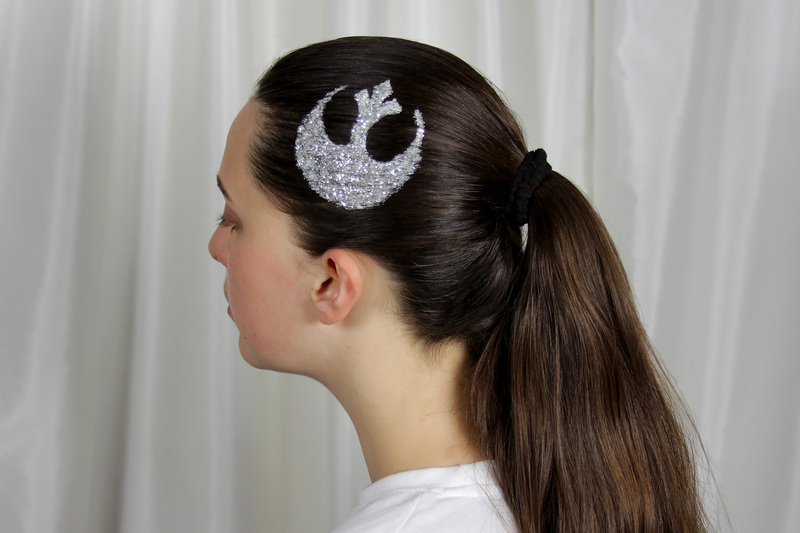 No matter your hair colour or length, two buns with a middle part is very recognisable as a Princess Leia inspired style, especially when paired with a Leia themed outfit. 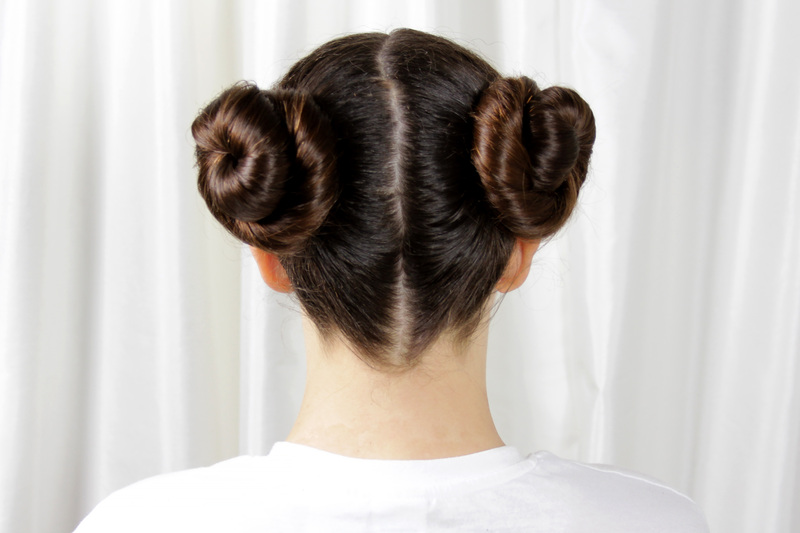 In Carrie’s autobiography The Princess Diarist, she recalls how the iconic ‘Leia buns’ came about – she actually had a part in choosing that particular hairstyle. When going through many options of ‘space hair-dos’, Carrie thought the buns were ‘better than a lot of the others’. 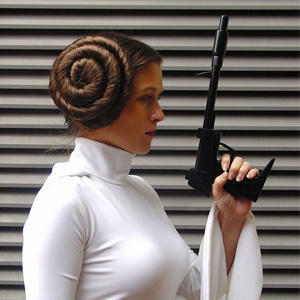 I was so happy to read that – while she may not have exactly loved the style (it took two hours to style for the film), knowing that she had a part in creating Leia’s look for A New Hope makes the classic ‘Leia buns’ even more special to me. Next up – the glitter! 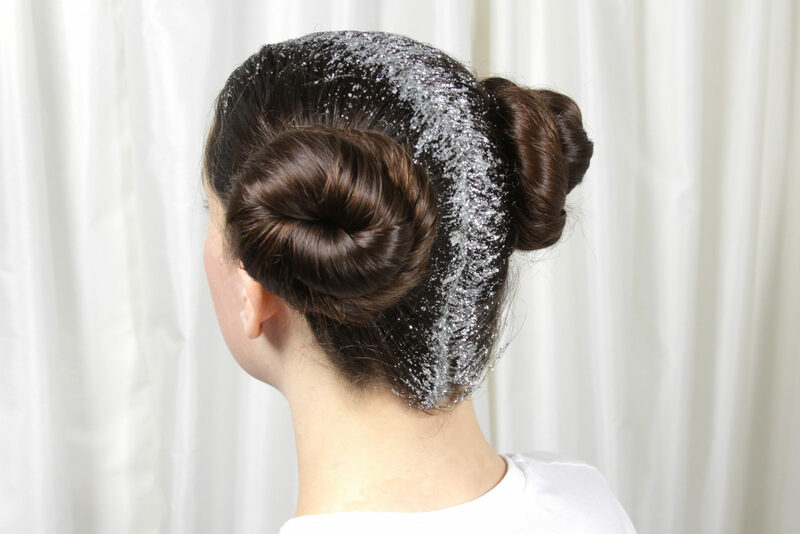 I choose silver glitter, as I always think of Princess Leia’s silver accessories for her Yavin Medal Ceremony outfit. I bought a small bottle of cheap craft glitter, and a small tub of clear hair gel. 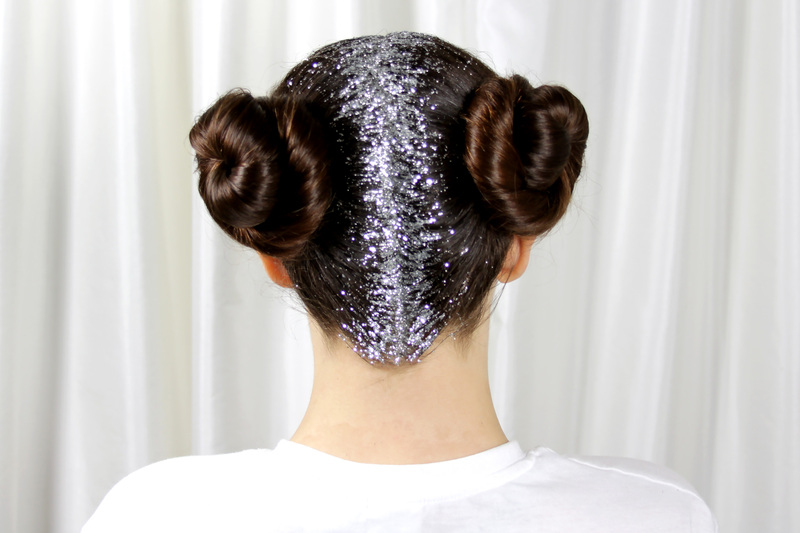 I put a small ‘glob’ of hair gel in a little bowl, and poured in the glitter while mixing the two together, until I had a good consistency – enough gel to get the glitter to stick to hair, but still enough glitter to really stand out. Using a soft makeup brush, I painted the hair gel/glitter mixture onto the hair part, and fanned it out towards the hair buns. I completely coated the hair part, but you can apply the glitter in any density that you like. You can also add any additional sparkles like star-shaped glitter confetti pieces, or stick-on body rhinestones etc. There are so many ways to be creative with this look. It is bold, and sure to get attention – the glitter really sparkles beautifully in the sun. There are many sizes/grades of glitter – the one I used is more of a ‘classic’ glitter with tiny dots, not a finely milled glitter powder. I found this was a good size to stick to the hair, and has a good reflective surface to really catch the light. Of course you can use whatever size/colour glitter you like – though just a little warning, this glitter will follow you for sometime afterwards! But hey, seeing glitter sprinkled around my house afterwards just makes me smile and think of Carrie. So what can you do if your hair isn’t long enough to put into hair buns? 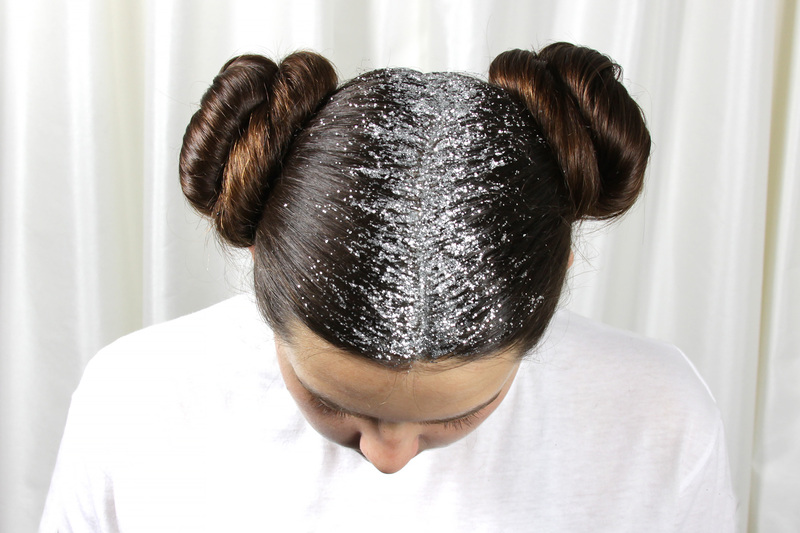 Don’t worry, you can still add Princess Leia inspired glitter to your hair in other ways! Here is one example that I love to do – a glitter Rebel symbol! For this version, I used white face paint and the same hair gel/silver glitter mixture as before, but you can choose any colours you like to coordinate with your hair colour or outfit. Slick your hair back in your preferred manner – a ponytail works well if your hair is long enough, or you can slick back shorter hair with hairspray or gel. I printed out a small Rebel Alliance ‘starbird’ symbol on paper, and cut out the center to create a stencil. Holding the stencil in place, I used cheap white face paint and small makeup brush to paint the symbol onto the hair. Once you have the symbol all painted on, grab some glitter mixed with hair gel, and paint it over the symbol with a small brush.